Bee-atrice is looking good. Okay, the yard sign on her head isn’t too flattering, but it was all I could come up with in a hurry. We will fix that later. When Bee-atrice became aware of her beauty she developed a real attitude. Her long golden hair, the color of the setting sun, a beauty mark on her face, and the fact that she was carved out of a hard wood by a professional wood carver made her vain. 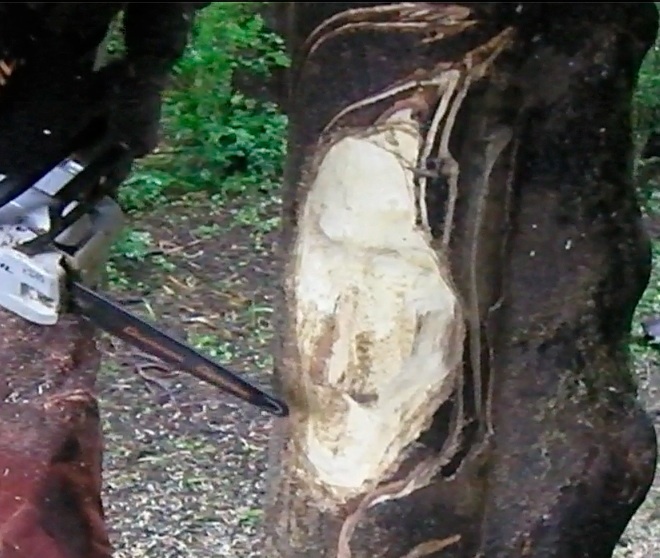 In conversations, the iPod would always be pulled out to show how she was carved. She would tell people. “I’m special. 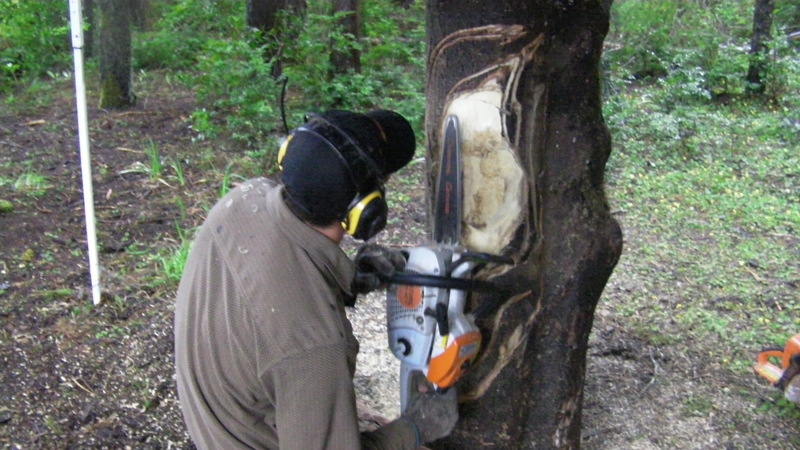 I was carved out of myrtlewood which only grows on the Oregon Coast and in the Holy Land.” We told her the brochures weren’t exactly true, myrtlewood also grew along the California Coast, and the kind in the Holy Land was a different variety. She would counter with the fact that “Myrtlewood” is the only wood still in use as a base “metal” for legal tender, “besides my mouth was carved ‘open’ so I can sing.” I think she fashioned herself as some kind of diva or something. We decided to place her near Bee Beard. We just figured they’d hit it off because they had so much in common. 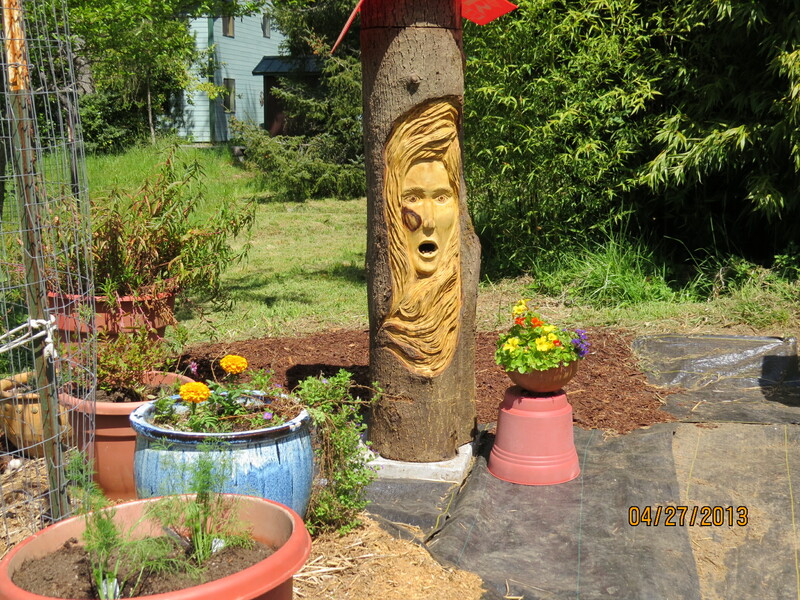 One look at Bee Beard and she realized her open mouth was carved to let bees pass in and out. She was shocked and humiliated…stomped off in a huff. I couldn’t figure it out. Bee Beard has never complained about anything, not even once. He’s been through a whole year of wind, rain, and bees. It’s true we’ve never smoked him or bothered him much, I just figured Bee-atrice would be the same. Not so…“I don’t want to be next to him and I don’t like bamboo. It attracts wasps. “ We ended up promising her a one of a kind Easter hat and face her into the sun so it could shine on her beautiful golden hair. She gave in to the flattery, but there was no way she would agree to be near Bee Beard or even to look at him. 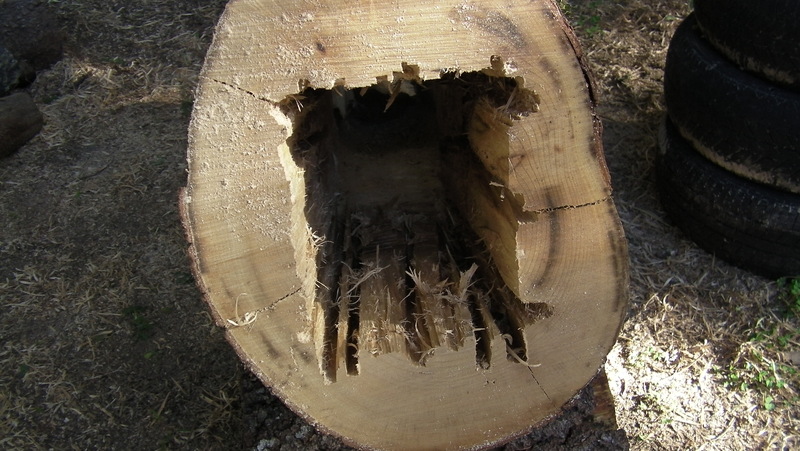 The bees first couple of nights were spent here in the corner of log. 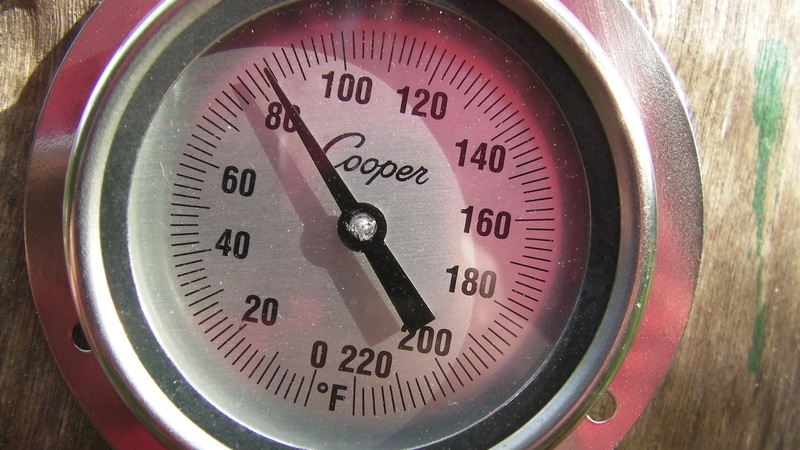 I’ve always wanted to note the temperature of the hive. I’m surprised the temp is only 83 F (28 C) I wish I could see inside better, but I’ll have to wait until the combs are visible in the observation window. 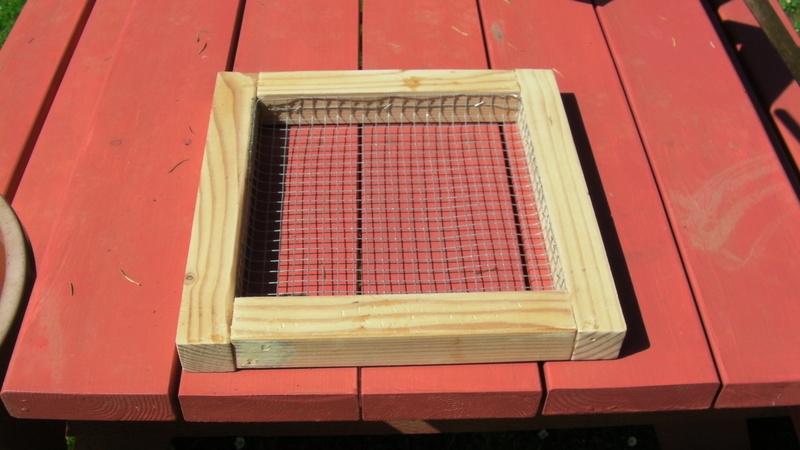 This tight #8 screen will hold the burlap. 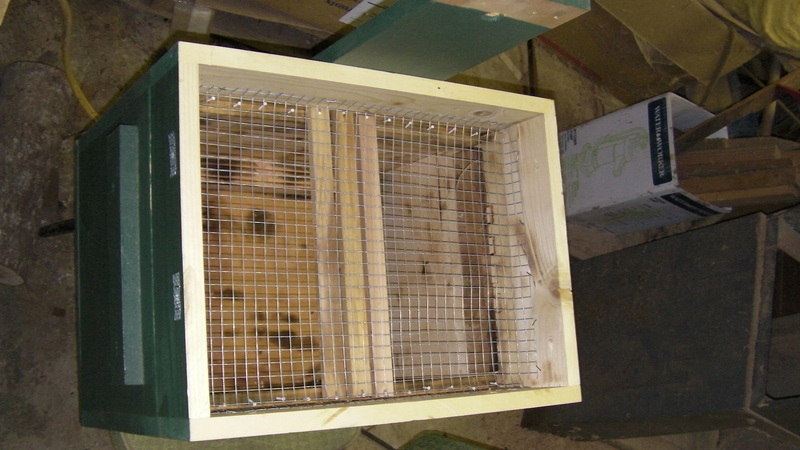 The wood shavings and sawdust will fill it up. 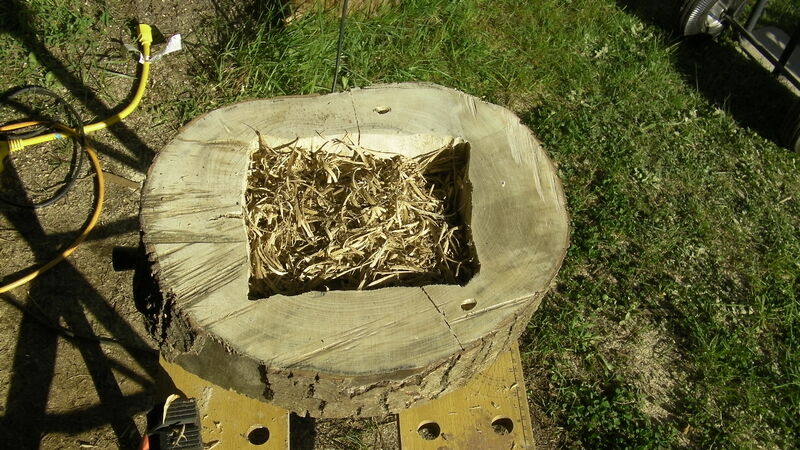 Filled with myrtlewood shavings and sawdust. 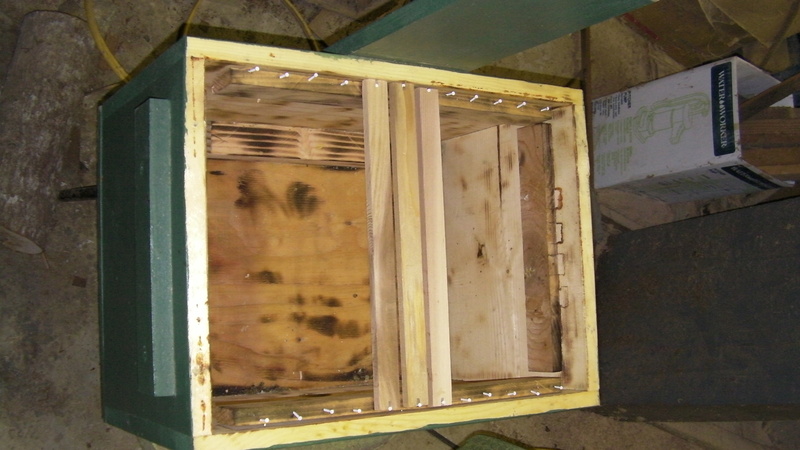 Myrtle leaves and sawdust are for the bottom of the hive. 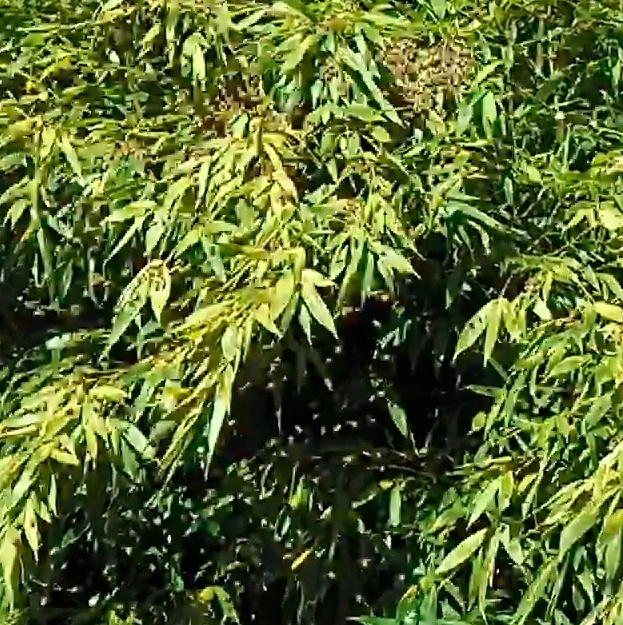 Bees live in Myrtle Trees. 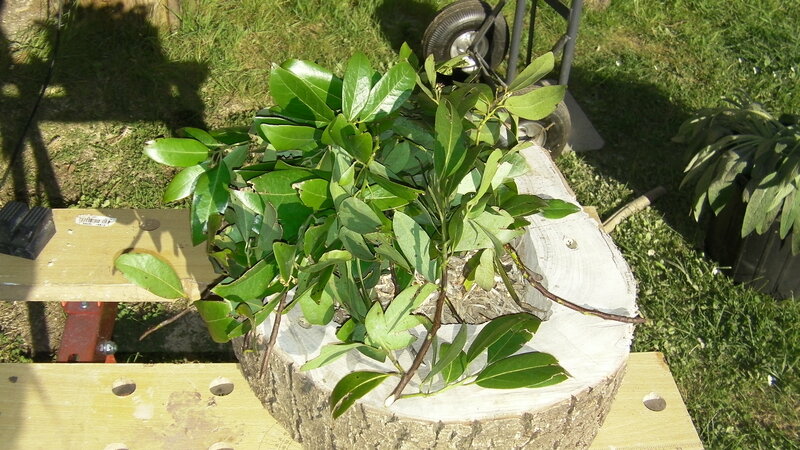 The wood smells good and the leaves are like bay leaves…you can use them in place of bay leaves, but in smaller quantities. According to wikipedia, the leaf has been used as a cure for headache, toothache, and earache—though the volatile oils in the leaves may also cause headache. 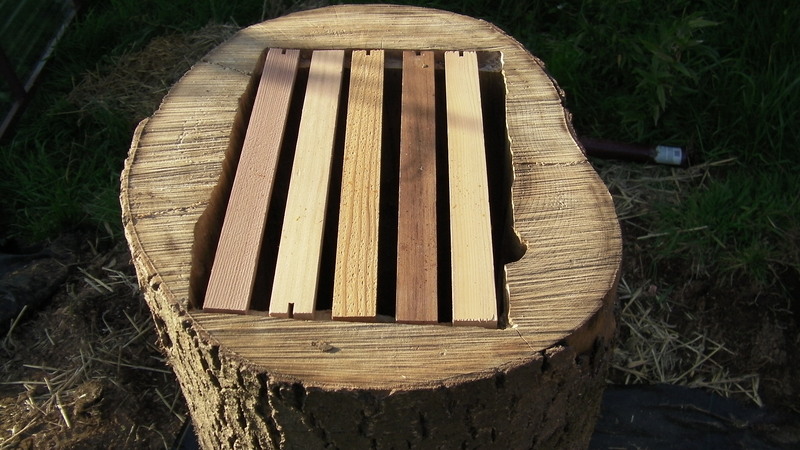 I used cedar sawdust in the bottom of my first log hive. 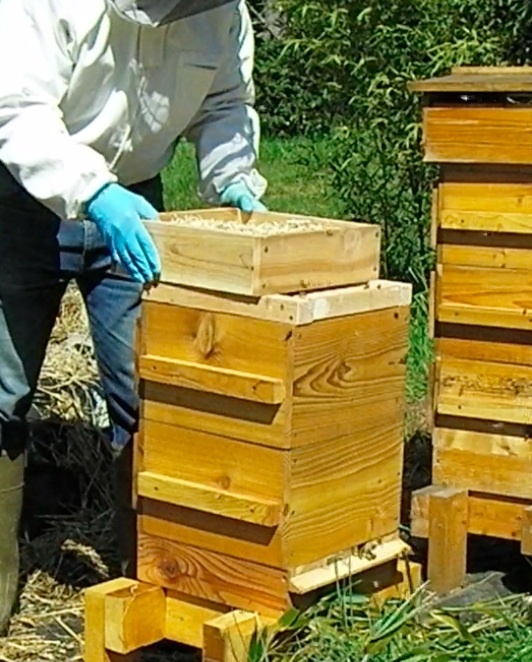 Phil Chandler of biobees.com was discussing the importance of hive ecosystem…“that it might be beneficial to have wood shavings and possibly dry leaves in the hope of stimulating an ecosystem similar to the natural environment where perhaps earwigs and woodlice etc. 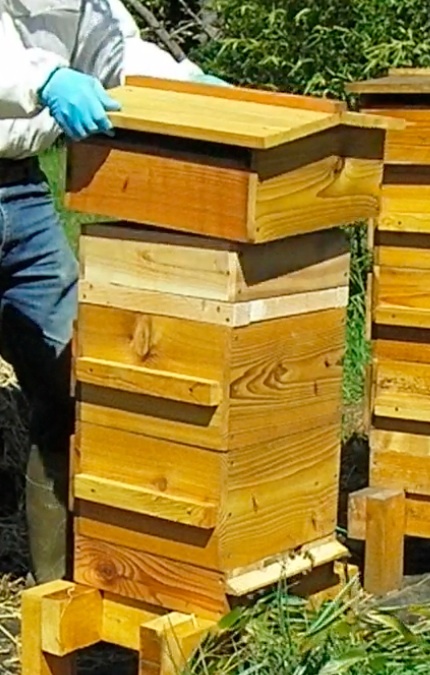 would live below the bees and maybe eat any falling varroa.” Since my first log hive survived the winter intact, without me feeding or medicating them, I think I’ll try the sawdust option again. This time I’ll add myrtle leaves to the mix. I’ve been saving the last of the old comb in the freezer. It’s time has come. 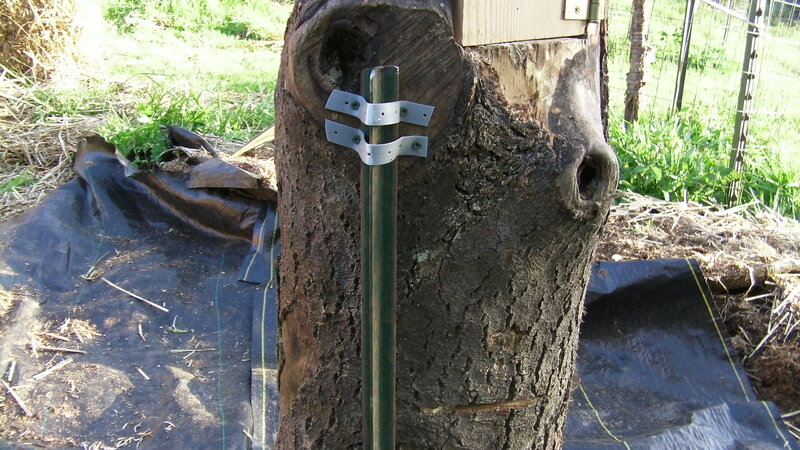 Fence post anchor…two were planned, but the swarm came first. We left town to visit the grandkids. It was just a day trip, but when we got back a little package was waiting for us…hanging from a tree. 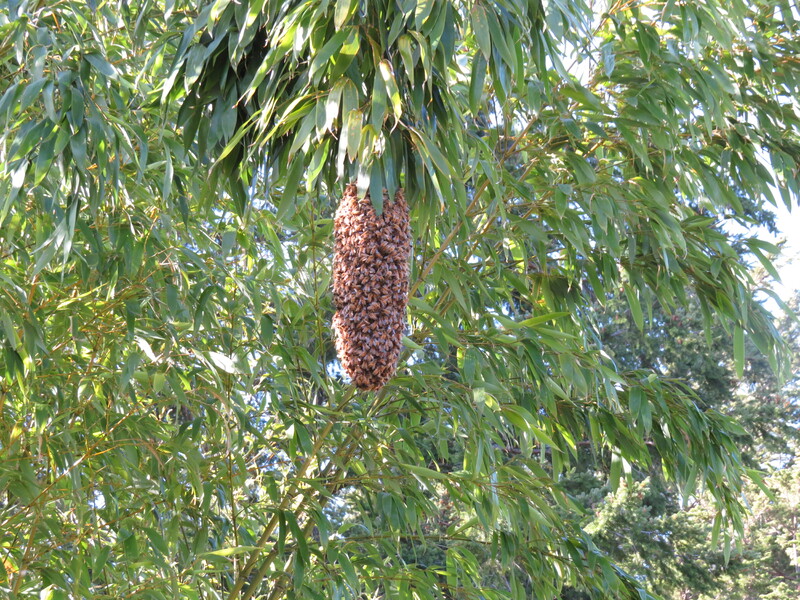 Because of the angle the picture was taken, this swarm looks bigger than it is. 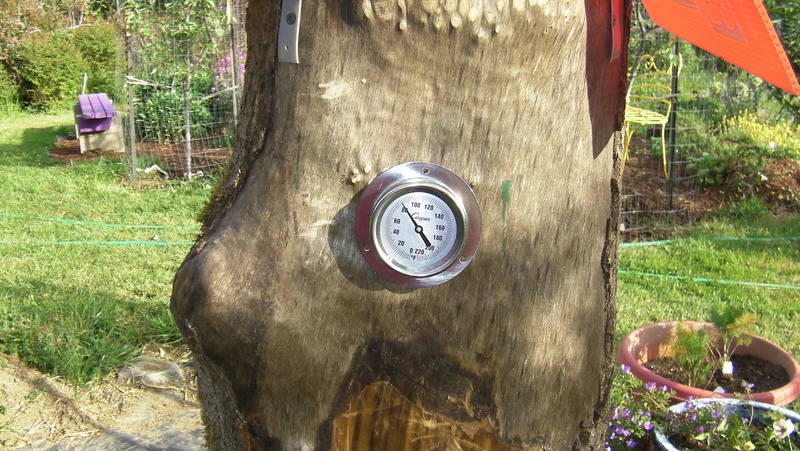 Tree hive in background. Thankfully I was prepared. 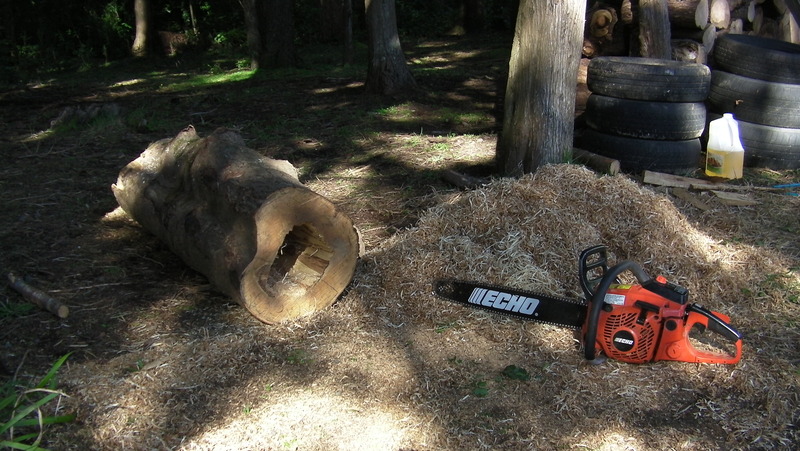 All that I had to do as it was getting dark was to snip the branch with a bucket under it and carry it to the log…remove the top bars and drop the swarm into the log. 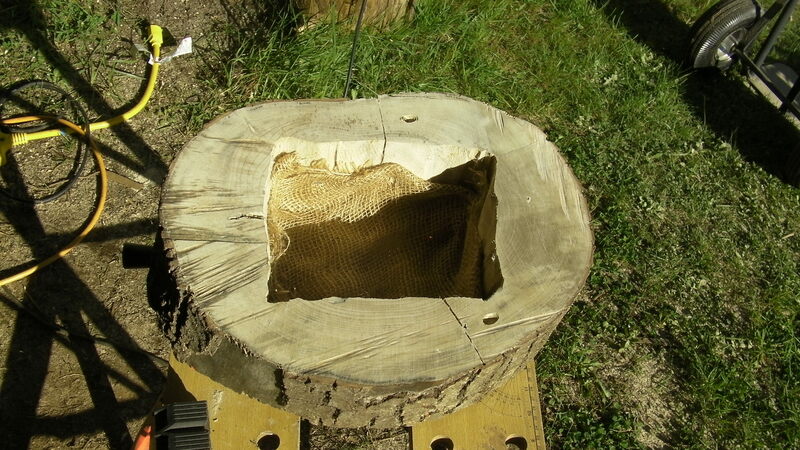 This is swarm #5 from Bee Beard Log hive. 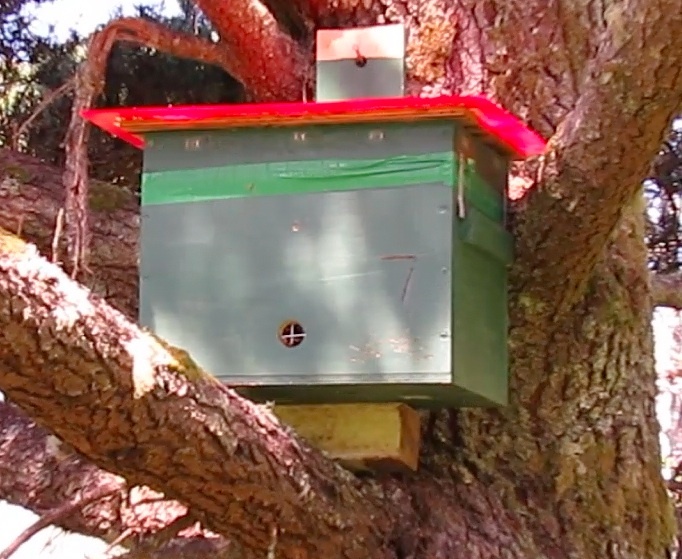 It probably does not have a mated queen, but the weather looks good for the next 7-10 days, so it should be a safe bet that the queen will be able to fly out. 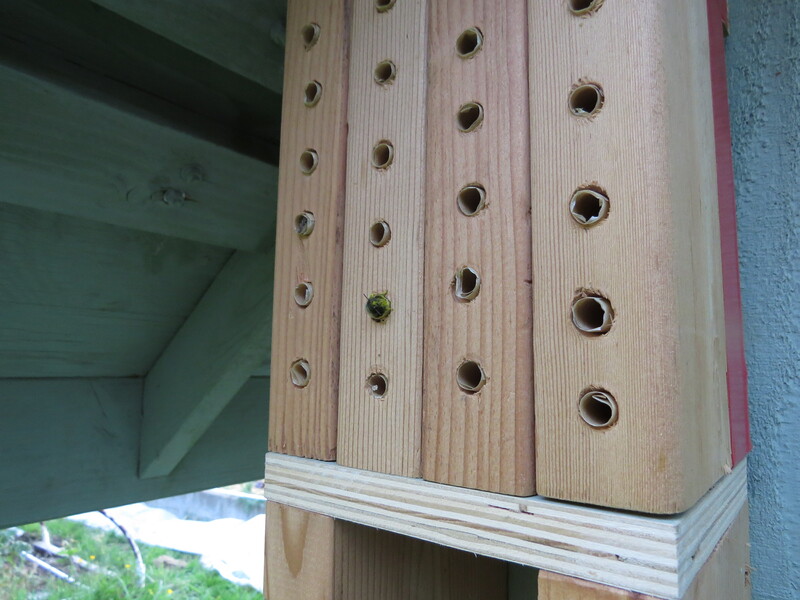 Unfortunately this small swarm never quite made it. It was slow to build up and just didn’t have the numbers to survive the week of freezing nights we had in December. Good news though. 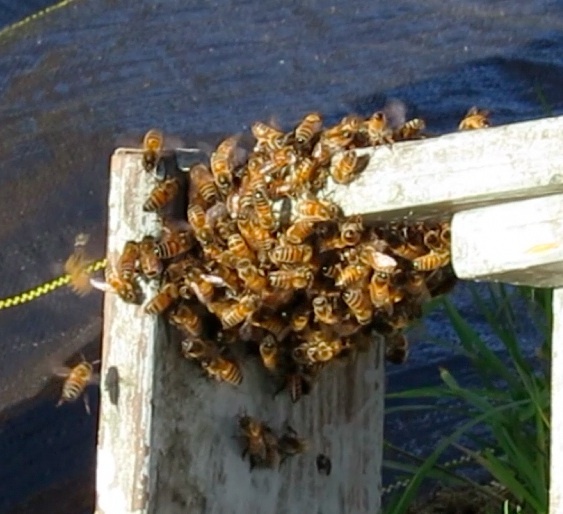 A prime swarm picked out Bee-atrice for their home on or about June 6, 2014. Brian brought his own tent awning to use. 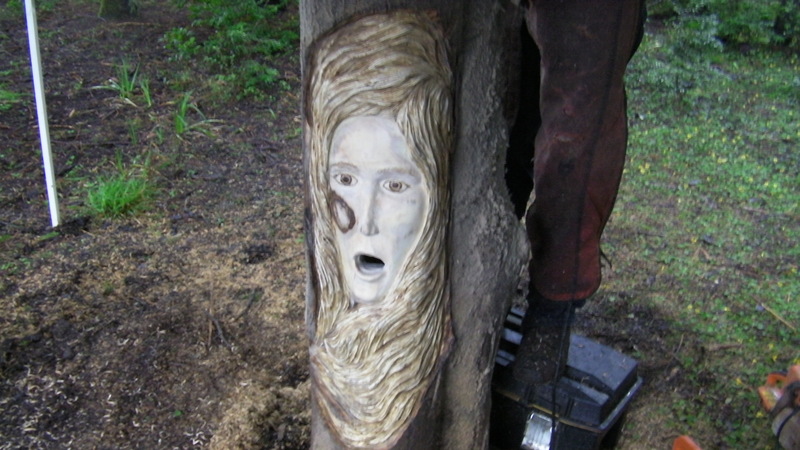 When I talked about carving another face on a log hive, I wasn’t sure what I wanted. 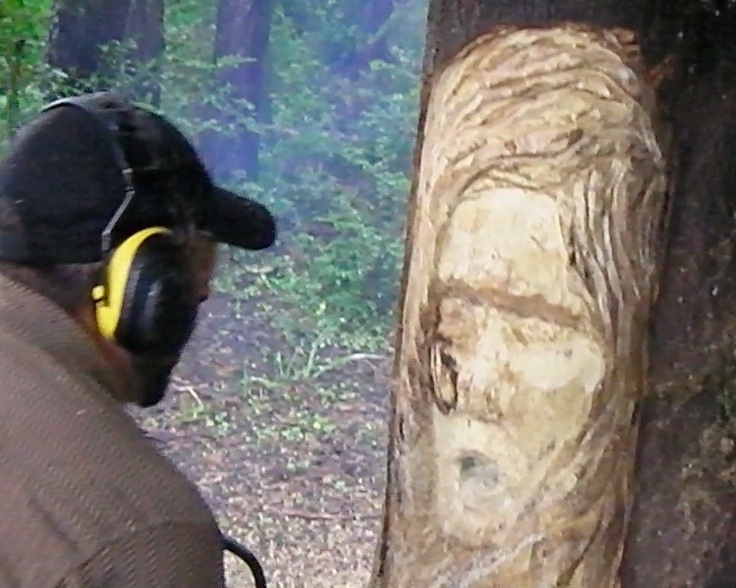 I had looked at hundreds of google images, wood carvings, even some Northwest totems, but I didn’t see anything that ‘jumped out’ at me. I told Brian and Zada Vorwaller they had done such a great job with Bee Beard that I wanted something along the same lines, but slightly different. Brian suggested a female companion. He said he’d been thinking about how he could accomplish it and was up to the task. I thought for a minute how Bee Beard was one of a kind, but in that role, there was a certain loneliness. It might be good to have a companion…and yes, a female one at that. Little did I know what I was getting myself into. Brian rolled into my driveway about 10:30 am on a windy, rainy day. 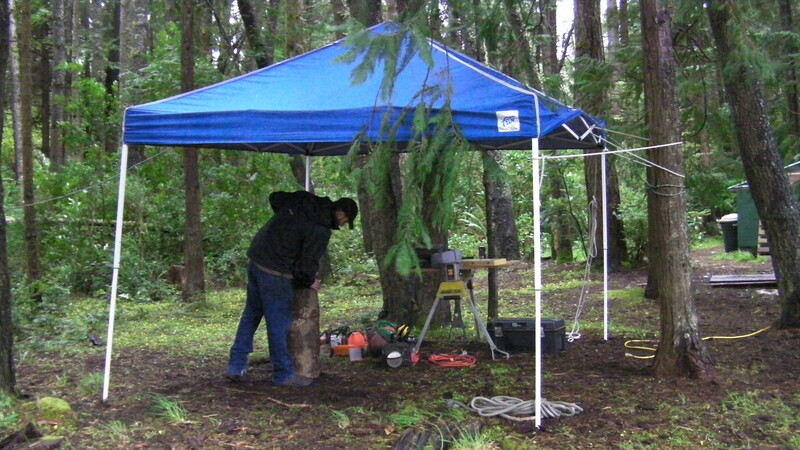 He’d brought a tent awning which he set up in the woods not seeming to mind the dead trees swaying above him. 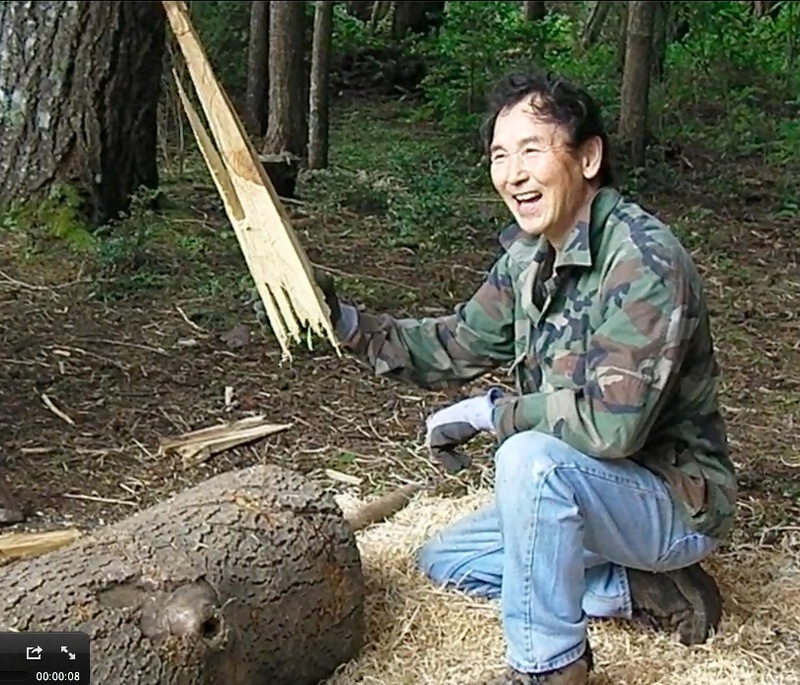 We propped up the log and he started feeling out the wood. I held my breath. After about 15-20 minutes he says “I’m beginning to see her.” I had given him a real challenge. 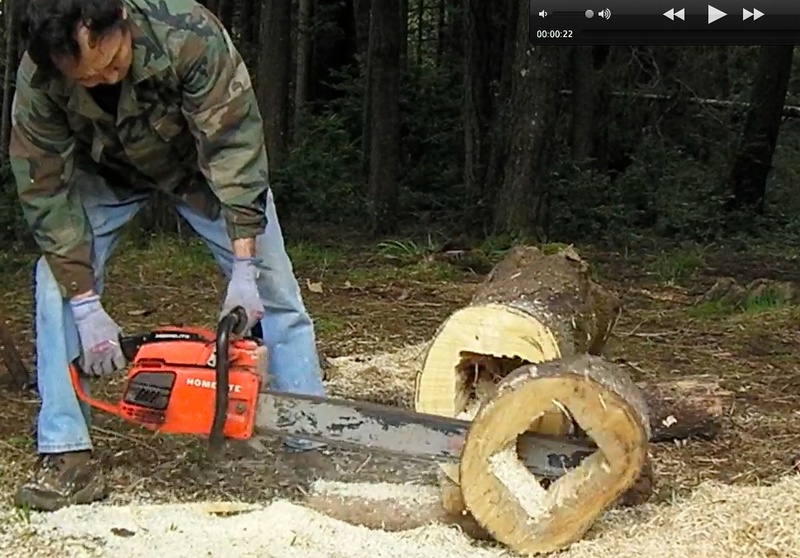 The big chainsaws had dug deep into the wood. 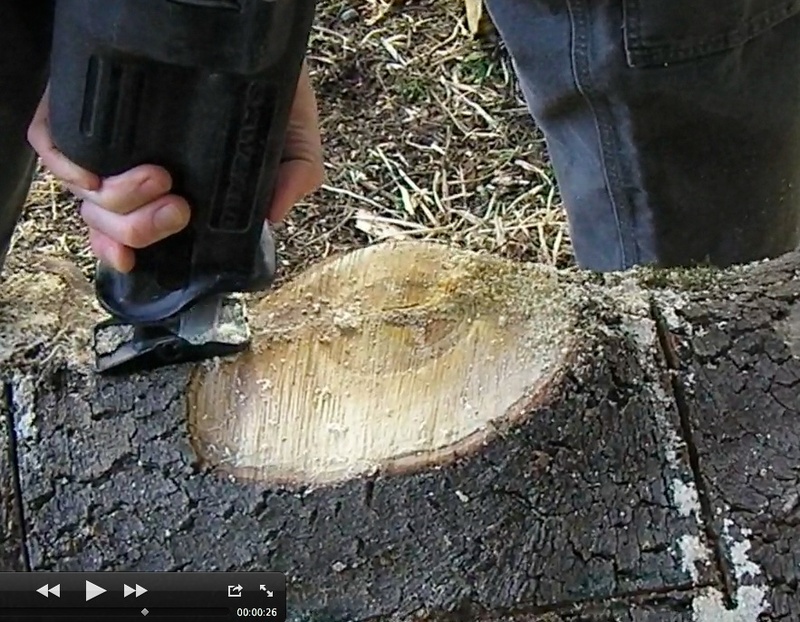 These deep grooves must be smoothed out. 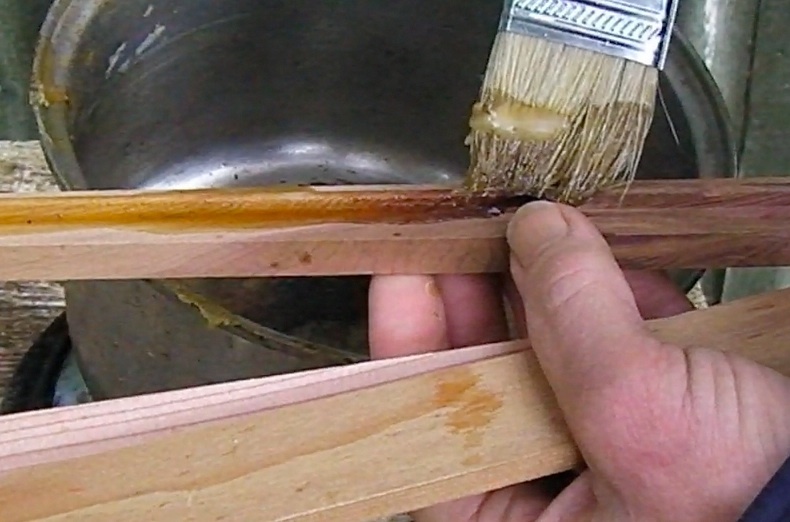 Bees don’t like sharp edges. 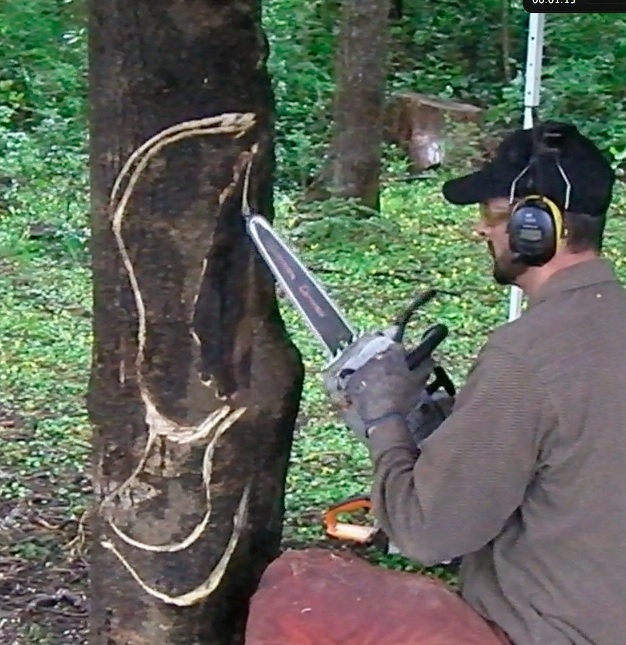 When I used my Sa-burr wood grinder to smooth out the chainsaw grooves, it became apparent the wood was ‘thin’ at some points. So I was much relieved that he could visualize the image. He starts to work. The lines are drawn…it has begun! Not being an artist, it’s hard for me to understand how a person can visualize an image and then make it appear by sawing parts away. 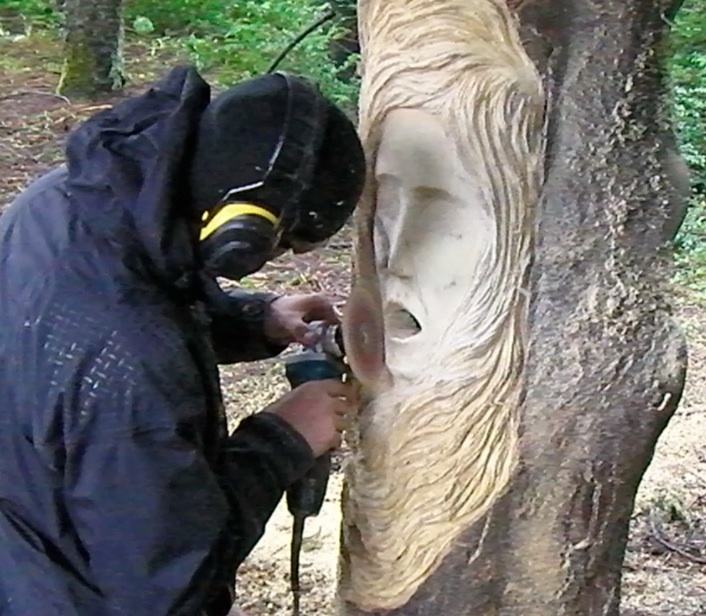 Sanding the cheeks…give her good cheek bones, Brian! then he adds the eye brows and eye lashes and voila…she appears! 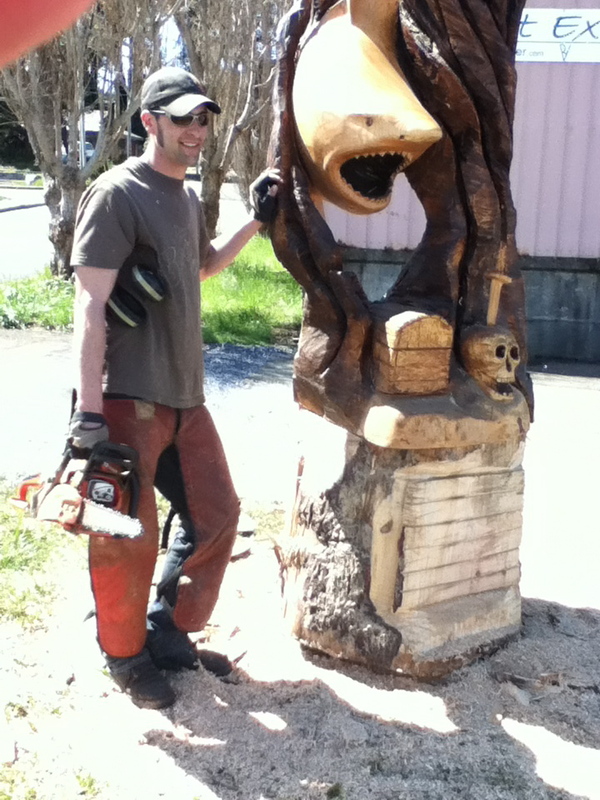 Brian Vorwaller of Artist Extreme, poses in front of his shark carving. 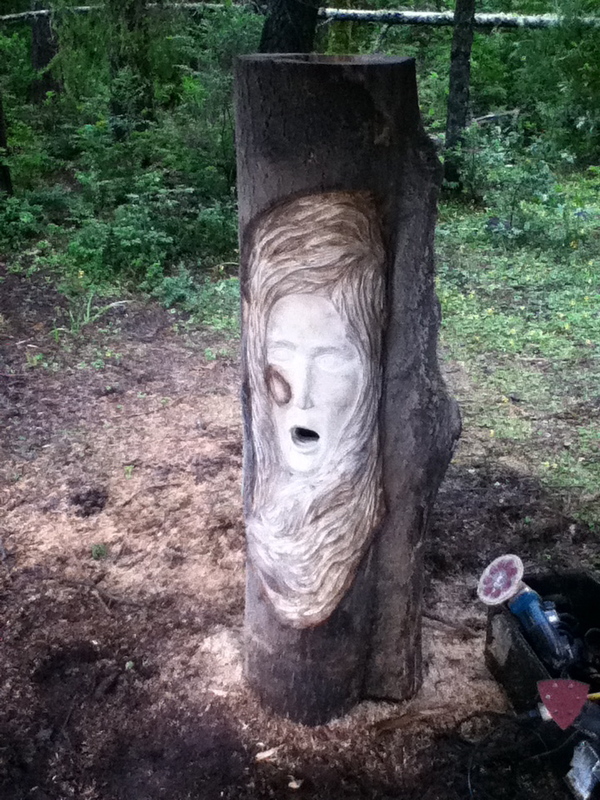 It was all carved from one chunk of wood. 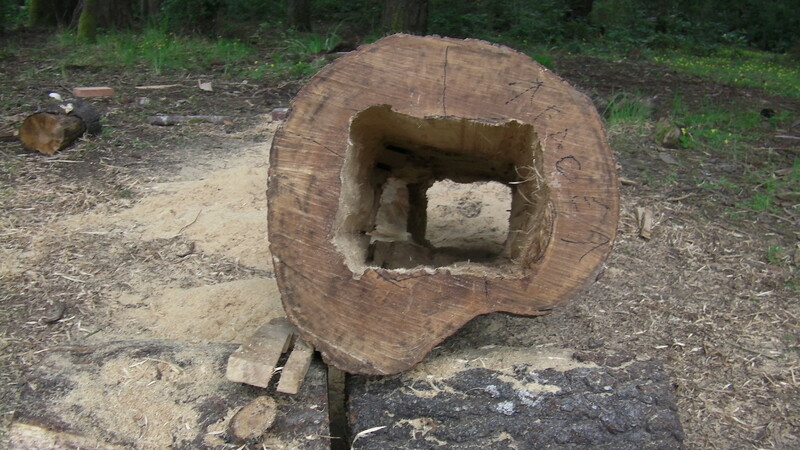 The beginning of the log hive. She was but a gleam in her father’s eyes. 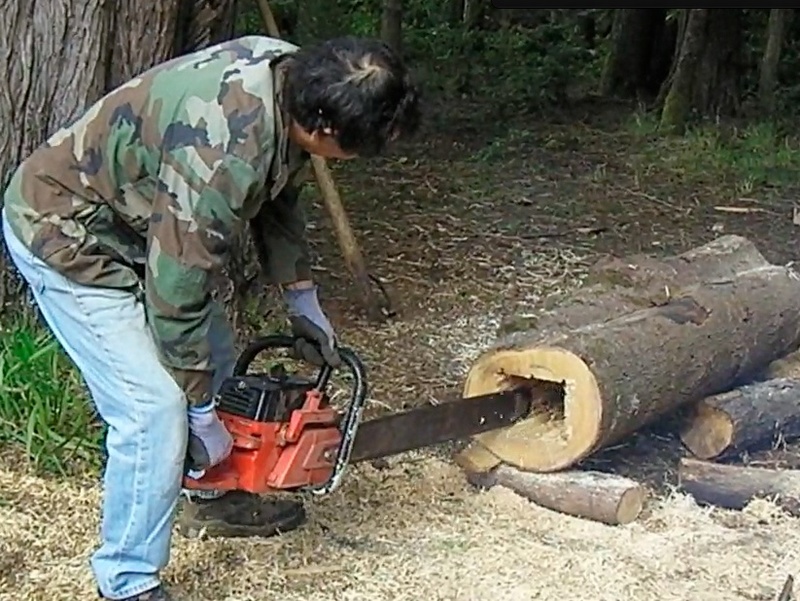 When Shigeo found out I wanted to build another log hive, he offered me a myrtlewood log. 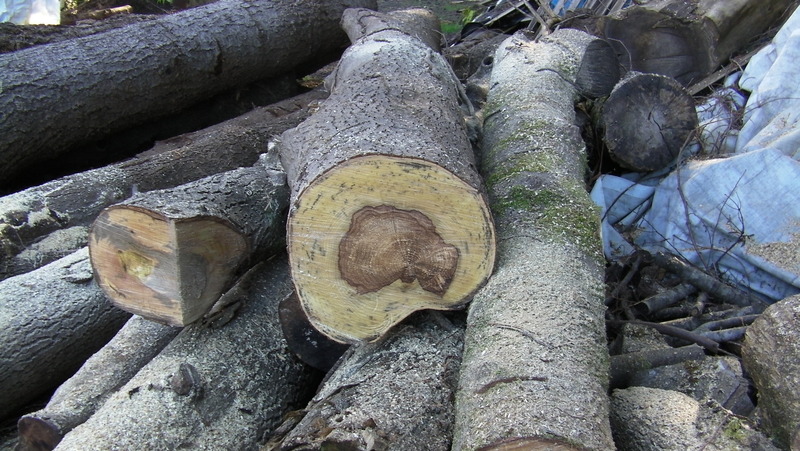 Myrtlewood is a hardwood that excels all other hardwoods in variety of color and beauty of grain. 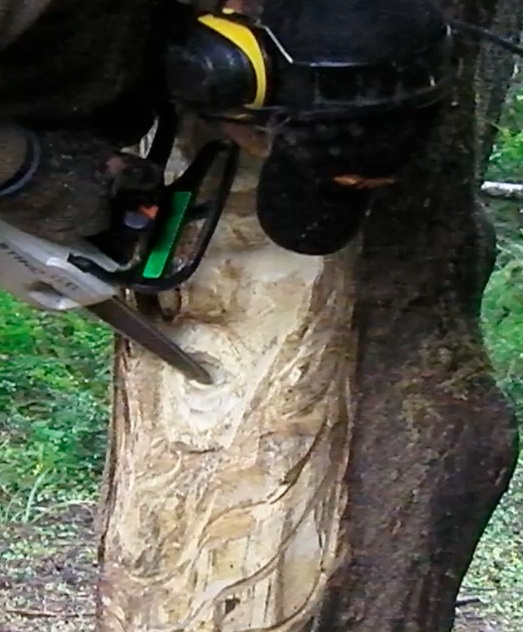 I was excited by the prospect because bees live in myrtlewood trees. 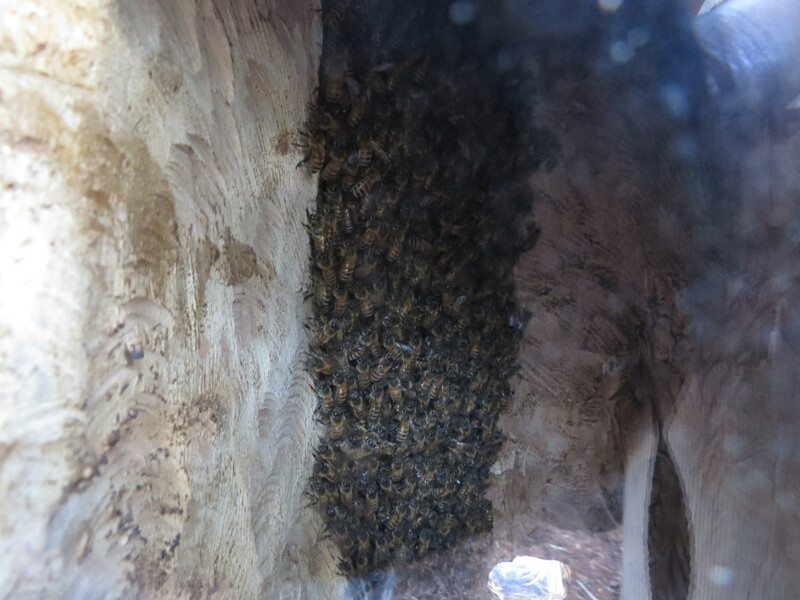 In fact, my other log hive, Bee Beard, is occupied by feral bees from a Myrtlewood tree. 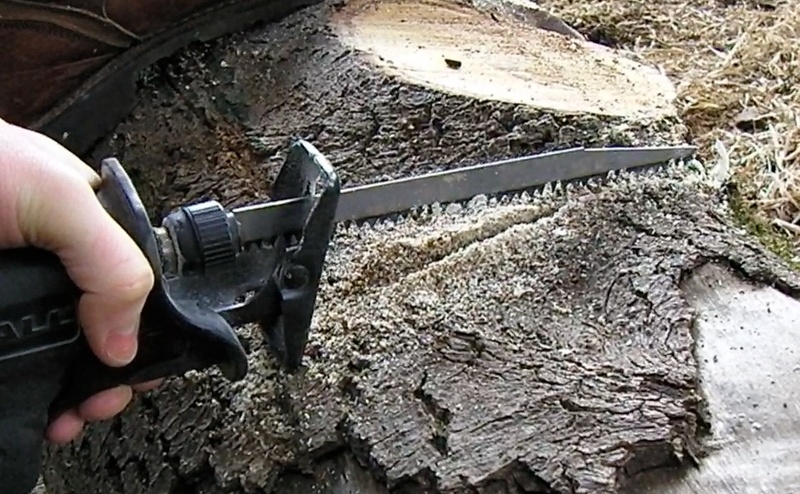 This is so familiar…when the chain saw cuts don’t meet in the middle, we’ve got to do it the hard way. 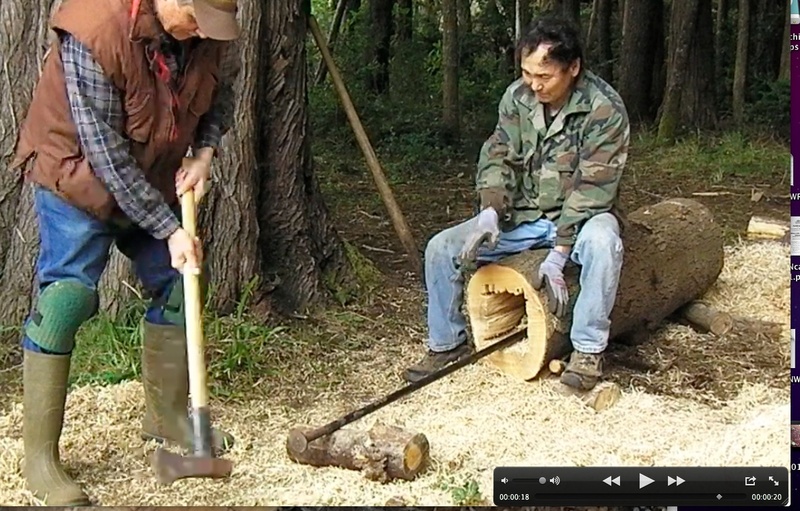 Progress…Shigeo pulls out some wood. Hollow all the way through, finally. Observation cut-out for window is completed. 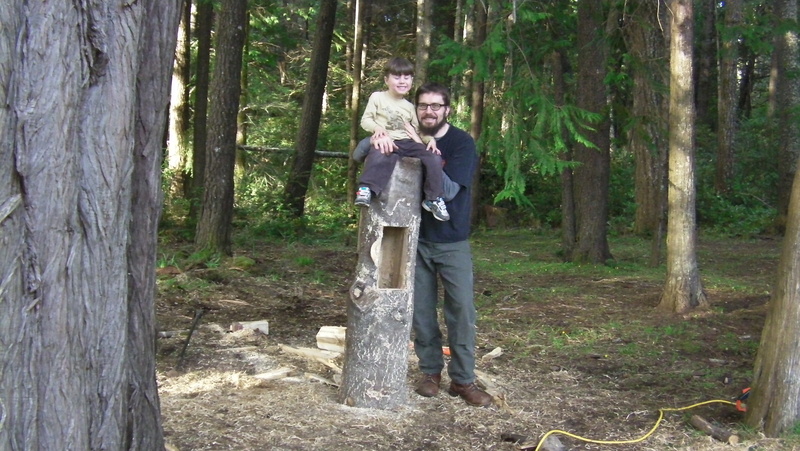 This was a lot of work…I’m glad my son was able to do most of it…I was able to visit with my grandson. 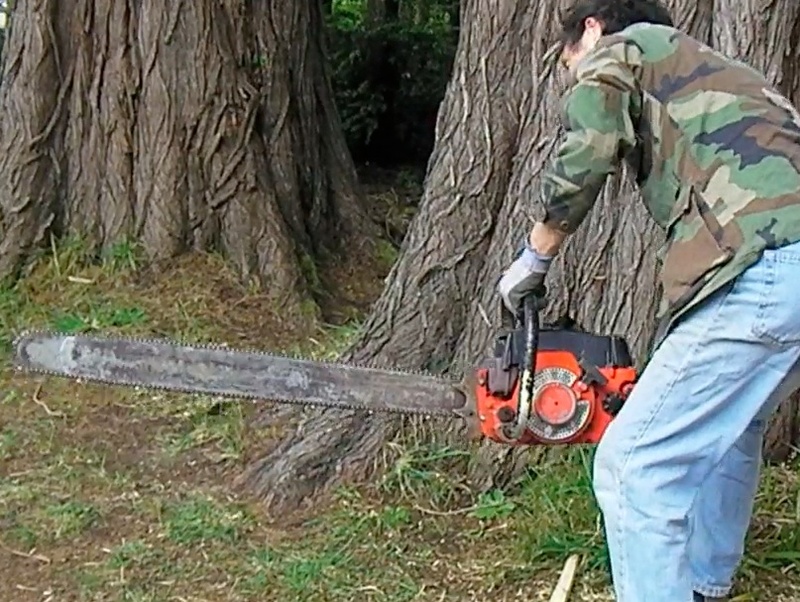 Good…I think we’re ready for Brian Vorwaller, the professional chainsaw artist who will be in town next week on April 4th. 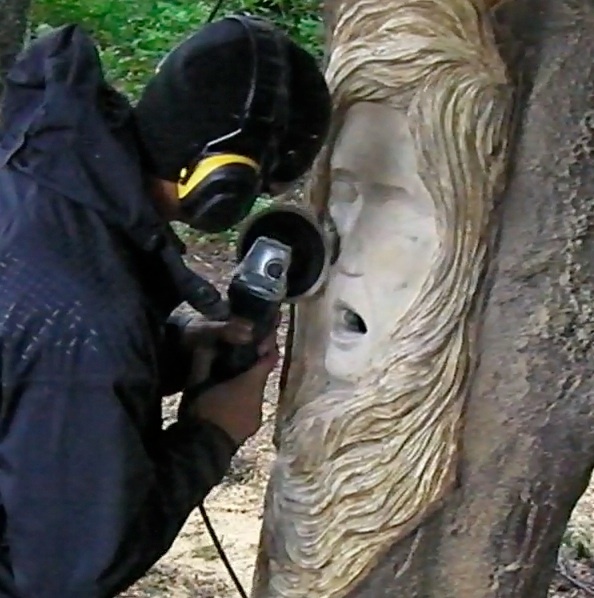 I wonder what kind of face he will want to carve. 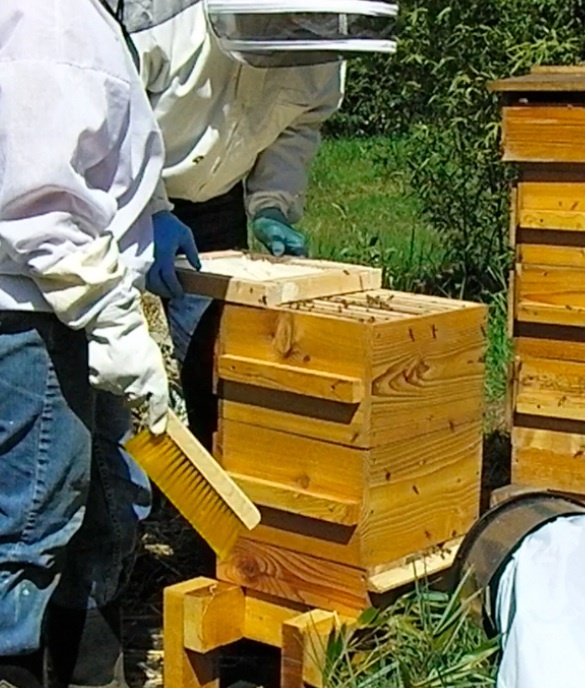 When we started keeping bees we read that a healthy hive will swarm, at least once every year. 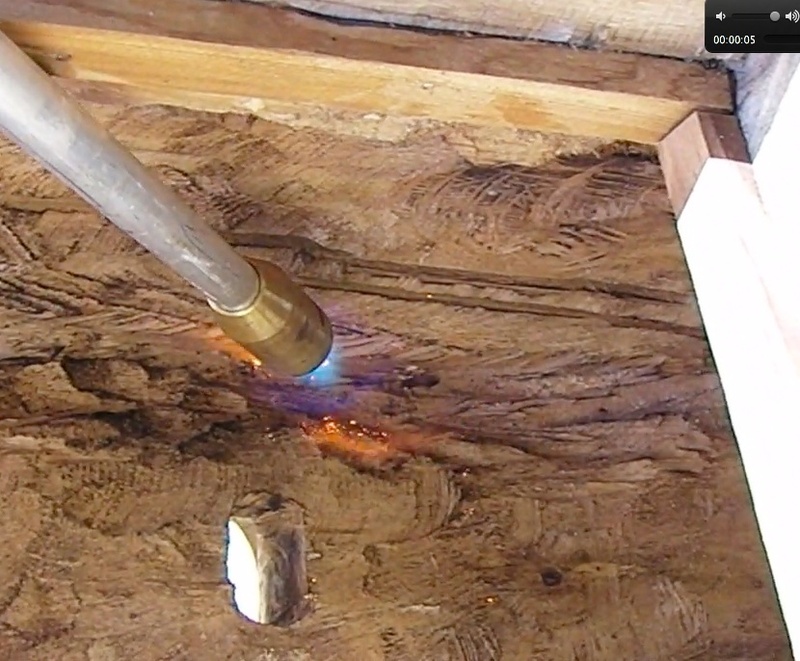 Our goal was to get through the winter without feeding, medicating, or miticiding. 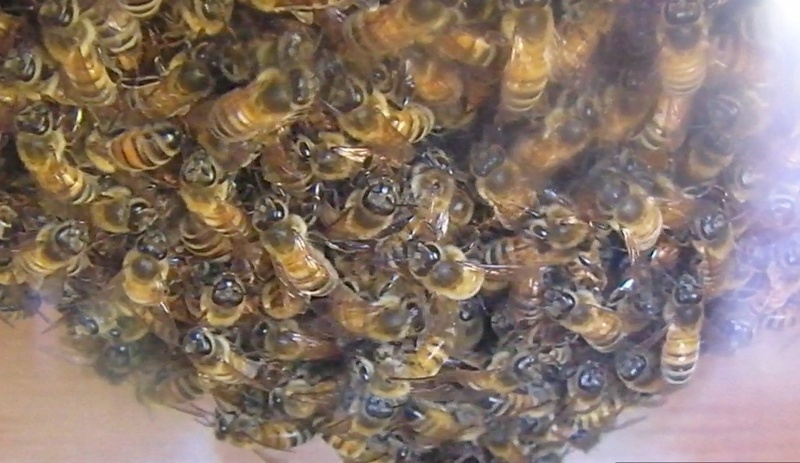 The swarm would be our sign of success. On a warm day March 30th, that’s what happened. 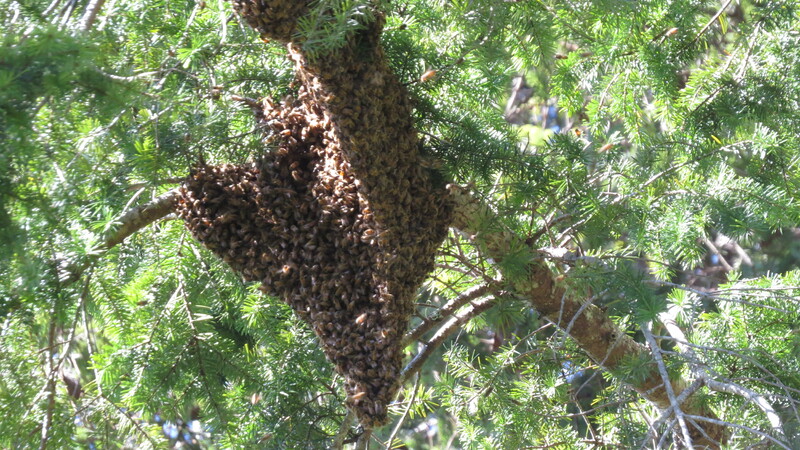 We heard the loud buzzing, came out to witness the bees heading up to the top of a nearby spruce tree. I even tried ‘tanging,’ banging a spoon on a pan to create noise so they wouldn’t go far and would form near the ground. I was wildly unsuccessful. This would have been the swarm to get, but it was clearly out of reach. 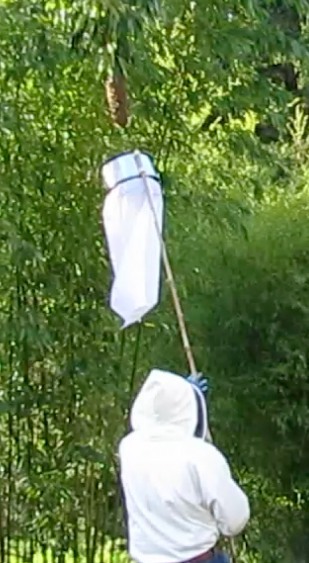 Well I ended up using a ladder to cut the bamboo and let the swarm drop into the white sail cloth basket. 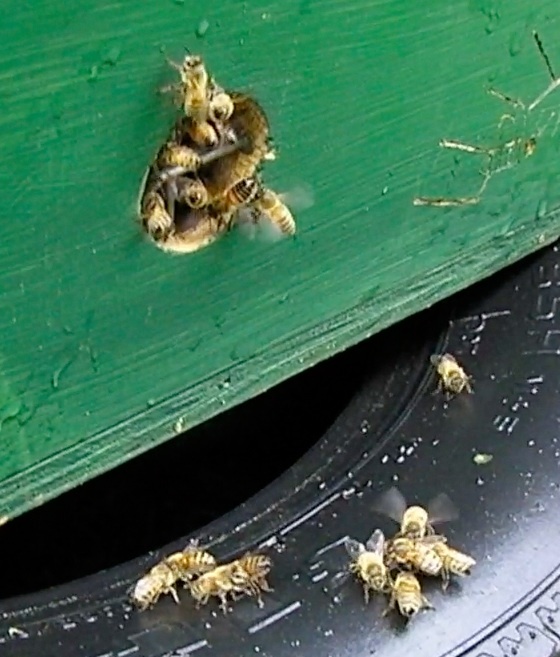 My wife noticed some bees on the ladder…we brought it near the hive for them to crawl in, but looking closer, we noticed they were fanning. The queen must be here. 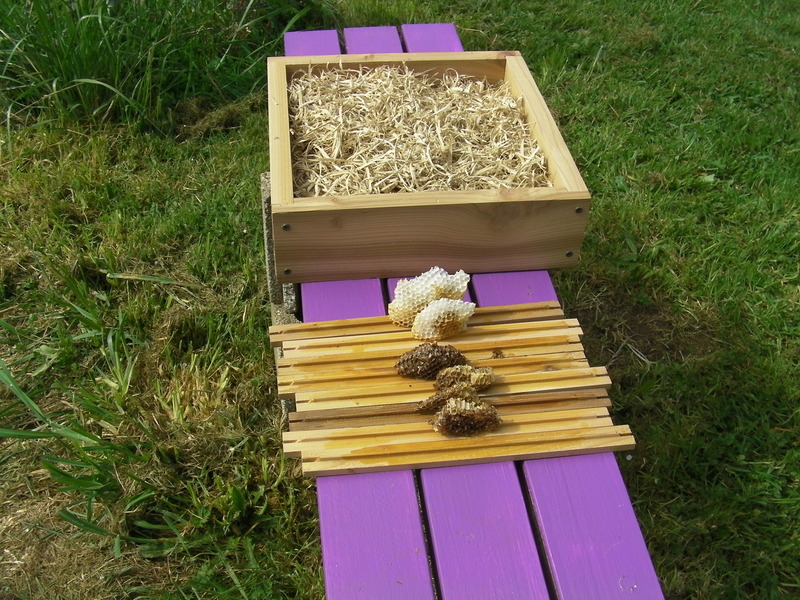 We gathered them up and placed them into the hive. 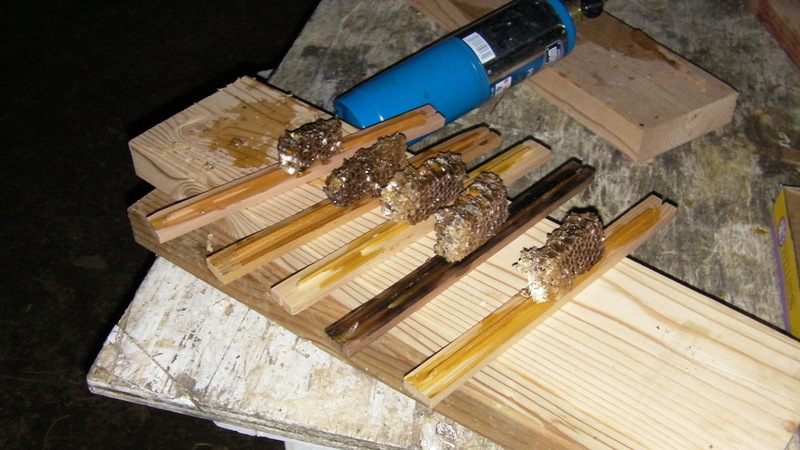 After the bees were dropped in, we added the top bars with comb attached…hoping they would stay attached once I hung them in the hive. 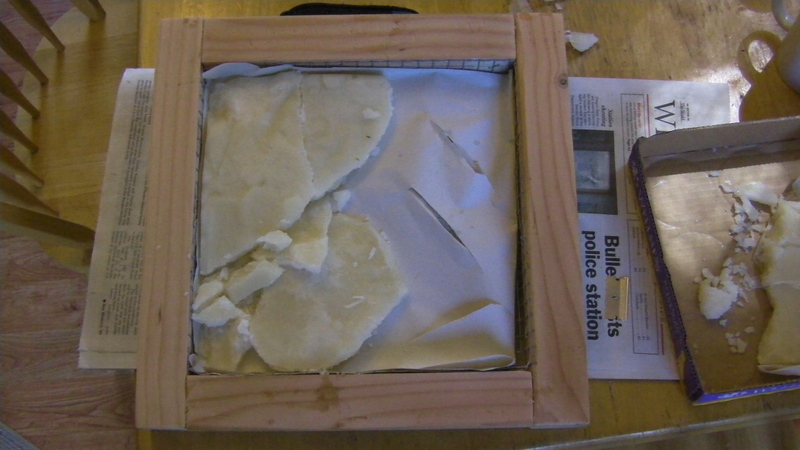 I had already built the sugar frame shown below. 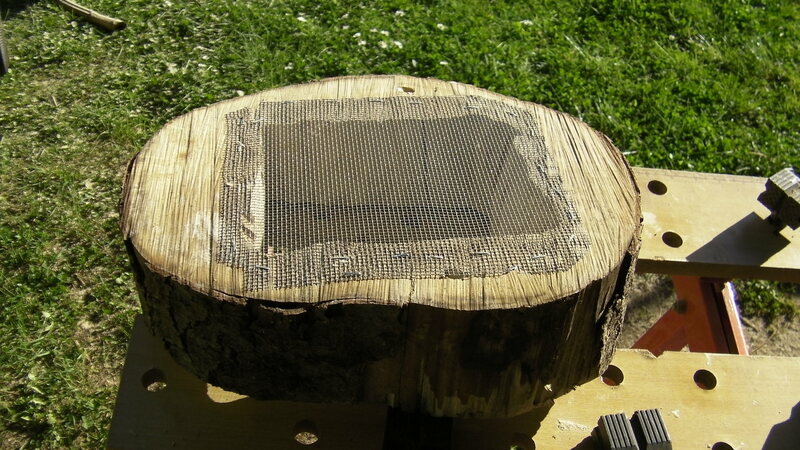 1/2 inch hardware cloth will hold up sugar if using newsprint. We slid the sugar frame into place. Next comes the quilt box. Top it off with the roof. 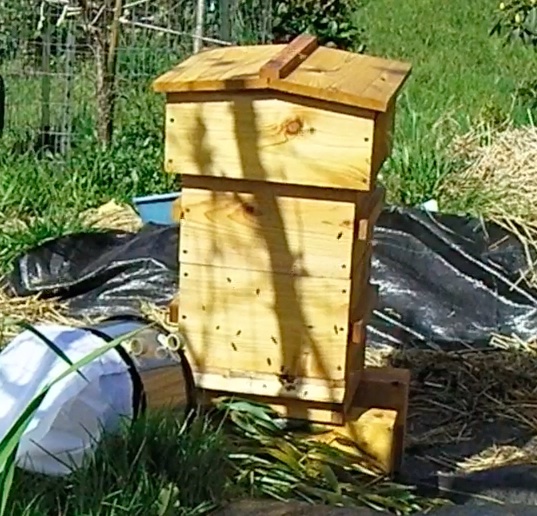 Matt Reed of beethinking.com, you made a nice hive kit. 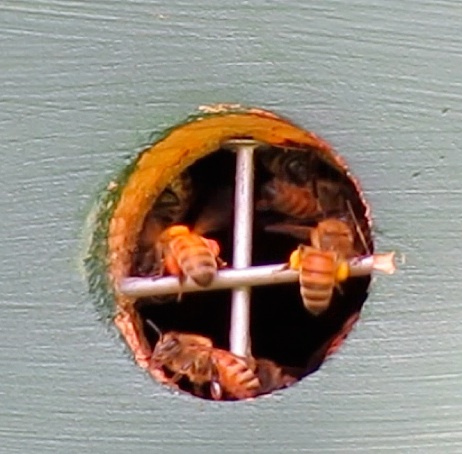 April 23…through the observation window we can watch the bees working. No new natural comb can be seen yet, but it won’t be long. 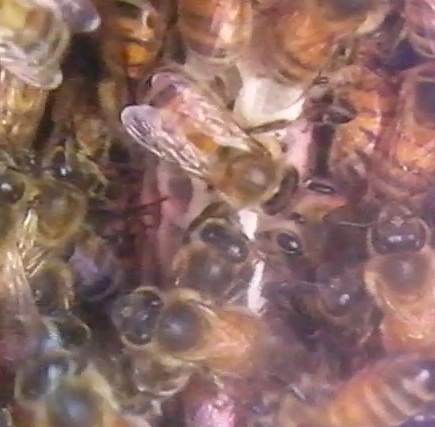 April 26, Natural comb can be seen on Day 9. 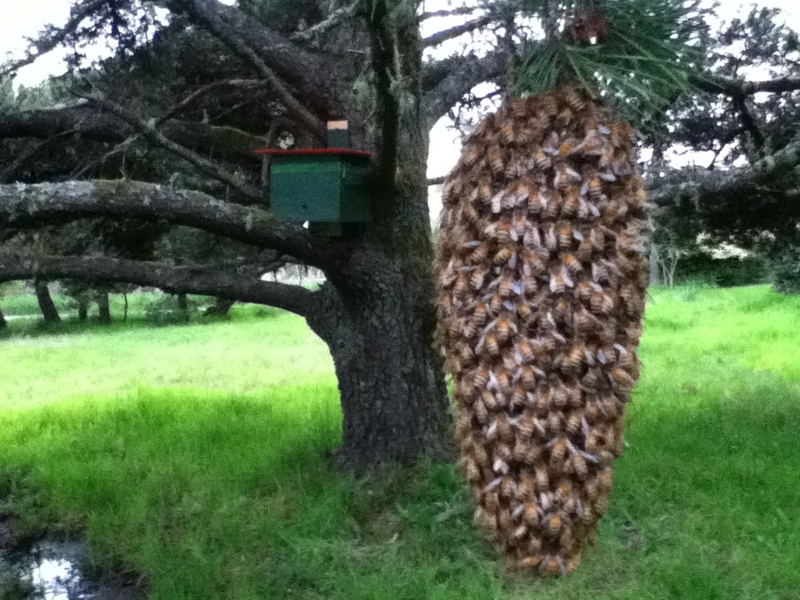 Where this and other swarms are coming from…Bee Beard Log Hive.